Duchess Kate celebrated her 31st birthday last night at the Royal Albert Hall with Prince William and the Middleton family according to Today who ran a couple of photos from the outing in this video (with many thanks to the eagle-eyed British Royals). @iamrena shared a tweet by Cirque Du Soleil's clown Sean Kempton who revealed the Duchess attended KOOZA at the Royal Albert Hall last night. 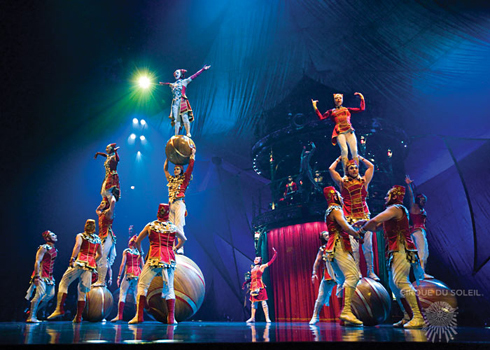 Cirque Du Soleil's KOOZA tells the story of The Innocent, a melancholy loner in search of his place in the world. KOOZA is a return to the origins of Cirque Du Soleil: It combines two circus traditions - acrobatic performance and the art of clowning. The show highlights the physical demands of performance and is set in an electrifying and exotic visual world of surprises, thrills and chills. 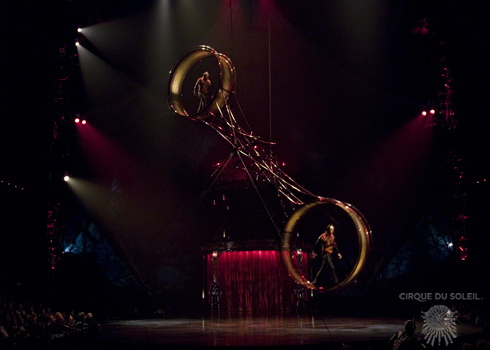 KOOZA's 1,600 pound wheel of death rotates at heart stropping speeds. 'The Royal party arrived to London's Royal Albert Hall at 7.15 p.m. last night, and headed straight into a private room (and bar) on the premises. At one point during the show, a clown onstage has his crown stolen, and pointed into the crowd, asking, "Who has my crown?". Both Kate and Carole burst into laughter and cast glances at William'. 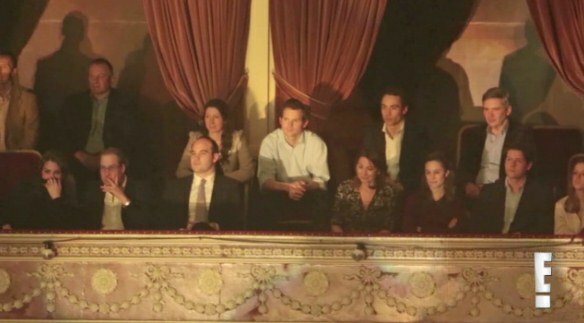 Judging by William and Kate's expressions they were thoroughly enjoying the show and appeared to be having a lovely evening. There were numerous reports claiming Kate had travelled to Angelsey to spend her birthday with William but Royal correspondent Robert Jobson confirmed Kate spent her birthday in London, a fact also confirmed by the photos. Kate appears to have worn a black coat/jacket and a striking pair of earrings. Possibly a gift from William? The couple were joined not only joined by the Middleton family but cousins Adam and Lucy Middleton and friends including Edward and Trini Foyle and David and Emilia Jardine Paterson (Trini and Emilia are old friends of Kate's from Marlborough College). The group sat in the Royal Box. One can view a gallery of photos at The Telegraph. If you've watched the above video you will already know the Queen has formally declared that a future daughter of the Duke and Duchess of Cambridge will be a princess. Under past rules a girl born to the couple would have been styled 'Lady'. "Letters Patent are simply a way that the Sovereign signifies making an alteration or proclamation that doesn't go through parliament. It's not very rare. They're quite commonly used for example whenever a life peer is created. When Prince William was made Duke of Cambridge that was a new Letters Patent under the Great Seal of the Realm." "The Queen has been pleased by Letters Patent dated 31 December 2012 to declare that all children of the eldest son of the Prince of Wales should have and enjoy the style, title and attribute of Royal Highness with the titular dignity of Prince or Princess prefixed to their Christian names or with such other titles of honour." Royal reporter Camilla Tominey shared news we will be seeing Kate "in a matter of speaking" tomorrow. Perhaps the portrait? What do you all think? ooh it is so exciting!! Can't stop beeing thrilled about the pregnancy! :-) sorry..
Good to see them together. How lovely. Thank you for the great post Charlotte!! I'm hoping that tomorrow brings the unveling of the Duchess' portrait - can't wait to see it! Just out of curiosity, how many portraits has Queen Elizabeth had painted over the years? Her Majesty has sat for 129 potraits during her reign. Thankfully she looks so much better than she did at Christmas and they seem to be enjoying their evening out. Here's hoping she continues to be well. Charlotte- Thank you for this great post. I just love seeing the beautiful Duchess & her Prince out together. The Duchess looked like she was feeling better. William looked happy to have his Duchess with him. Nice to see they were having a good time for her birthday. Wonder what she received from him?? Now that she is feeling better maybe she will return to Wales with William when he returns to duty. We can only hope. Thanks again Charlotte for the great update. Your the best. Yay! Lets see what kind of surprise is awaiting for tomorrow... I cant wait! I think Kate looks a lot fuller on her face now! Maybe she put on weight after the pregnancy? Although I'd say it's safe to speculate late June or July. I agree, Emily. I think all fans of Kate would like to know the probable time of birth. Honestly, to me, would be more interesting than the portrait. I think this "suspense" and this time of seclusion of Kate, has generated many negative critiques about her, then it would be good if the surprise is that the portrait, this is accompanied by some news about her and her pregnancy. Kisses! If you followed that they said Kate was still in her first tri-mester when it was disclosed she was pregnant, that was in mid - Nov. So with that and considering a normal gestation time, their baby should be born around the first in July...possibly late June. As protective as William is over their privacy, I would think he would not want anything to be disclosed until she is fully showing and folks could tell better Kate was X months along from appearance. That said, I really don't think we will see Kate wearing the formfitting spandex dresses that many modern women wear today during pregnancy. But I also doubt we will see her covered up like a tent either. She could set a whole new trend for maternity wear. We sure have seen years of showing off the 'bump' now. Do I really care if their daughter be a princess or lady? Of course not. All this royal thing just sounds pathetic in modern world. :) As long as the parents are happy and the baby is healthy, that's all I care about. I don't think it's "pathetic". We're not talking about Brad and Angelina's crew here. God willing, William will be King one day and therefore one of his and Kate's children will be heir to the throne. That is great news! But this doesn't mean that if the first born is a girl she will be queen even if her brother is born 6 years later right? Glad to see wills and kate out and happy happy bday Katie! It sounds like her birthday was really a family affair. Nice to hear she got to spend it with friends from school. I wonder if William put this together from his beautiful Duchess. The Duchess looked fuller in the face but I wished we could have seen her standing and her baby bump. Now we wait until tomorrow to see what the surprise is going to bring us. And I wonder when we are going to hear when her do date is and what William will be doing in the future. Baby bump at 12 weeks??? I had a flat stomach until 6 months pregnant. Many women do stay flat until the 5th month or end of it - esp with their first child. It's the second one most of us pop out a lot faster. Emily I think the Duchess is passed the 12 week mark. The reason I say this is they are saying (in the media) that she could be due at the end of June or the first part of July. But I could be wrong. But in the pictures of her birthday she is looking fuller in teh face then she did on the Christmas church pictures. Yes she does look fuller. I would guess she is pregnant with a girl. When woman has a girl her face changes to worse. Kate doesn't look as beautiful as she is. It could be just a picture. I would watch her face in next months. If she gets rugged features, her face will be a bit masculine, she is having a girl. If she becomes more beautiful, feminine, her face will get soft features she is having a boy. It is all about hormones. Boy takes all the man's hormones from mother and she becomes more feminine. Girl takes woman's hormones from mother and mother becomes unattractive while pregnant. Also vomiting is a sign of girl (not always but in most cases). If pregnant with boy, no vomiting. I just love it when I stop in here and there IS something new! I too wonder what gifts the Prince gave her for Christmas and her birthday. I always guess jewelry. I care that if the baby is a girl (and that is what I am hoping for) that she will be a Princess. I am in the States so it doesn't effect me one way or the other, but I like that females have gained a bit of status. LKC- To agree with you. I would love to see this beautiful couple have a little girl. I can just picture William holding her in his arms and just smiling down on her. He will be a great daddy no matter what they have but I am hoping for girl. The Duchess is also going to make a great mummy. William is very protective now of his Duchess, can you just imgine if he has a little girl? Watch out boys...lol And if he has a little boy he also will be protective but maybe not as much. Let's hope her pregnancy contiunes to improve and she continues to feel better. I have tried not to create expectations around gender baby of Kate, I think being a girl or a boy, the important thing is that he or she comes with good health. I am the mother of two boys and I love being a mother of boys. I always wanted 3 girls but have 3 boys and wouldn't trade them for anything. Funny how life is. She must be feeling much better ! Wonderful news ! I would so love to see the Cirque du Soleil one day... I hear they are fantastic. Theresa I have always wanted to see them too. I think I would be like William and Kate in the video. She covers her face and he with his hands in front of his face. I think they are somewhat nervous for the acrobates.Very daring moves those people make. It appears that Catherine is growing her hair out on the sides. I am soooo glad. It really looks better. She is looking healthier. Great post. Thanks Charlotte! The Queen's proclamation is significant not only for the monarchy, but for Kate and William's family unit. It must be tricky enough to raise children knowing that one is destined to be King or Queen - never mind the siblings not being equal in rank. I cannot even imagine such a scenario. Also, the timing of the Queen's proclamation makes me wonder if perhaps Kate's pregnancy would have been announced after Christmas/early January had she not been admitted to the hospital. Also makes me wonder if early ultra-sounds look like this might be a girl? It's sort of early to say. Boys can look like girls at this point. Usually at month 5 you can tell, but many times not. Thank you for sharing the E! links, I added them to the post. The video is just adorable! Yes, it was reported on US Television on the Today Show that Kate's first official portrait will be unveiled on Friday of this week. So when did Wills start wearing glasses? I have seen him a few times now in glasses...including driving a car. Maybe he has worn contacts in the past, or are the glasses new? If he does need vision correction, that would impact his role as a helicopter pilot with the RAF. You cannot have any need for vision correction and be a military pilot if the rules are the same for UK as they are in the USA. That might mean he would have a different position with his rescue crew or perhaps he has been not filling the role of pilot for a time now & it was just never mentioned to the public? Love to see a zoom in photo of the maybe new birthday earnings. The quality of the photos/lighting does not probably allow for that however. We will have to wait and see since certainly Kate does repeat wear of many items. Glad she felt good enough to go out on her b'day. Hopefully the worst for her case of GE was with the first tri-mester and she won't feel too bad here on out. Heh Charlotte...I saw the Today Show segment on QEII's decree about the baby will have the title of Princess if the baby is a girl and thus be first in line of William's children to ascend the thrown. But in this story it said Kate was 3rd most high ranking woman among the royals. So who is second after the Queen right now but before Kate? Is it Camilla because she would become consort when when Prince Charles succeeds his mom? I looked around on the web but failed to answer my own question. Hello beachgal :) You are indeed correct about Camilla, she will be Queen consort when Charles becomes King. Thanks so much - that's what I thought sounded feasible to me. If that is true what a bunch of rubbish. I don't think their privacy was invaded in any way on this occasion and it was a normal PUBLIC show. There are photographs in the "Telegraph". A girl might have Diana as one of her names, but it would not be the first name. Correct me if I am wrong Charlotte, but don't all heirs to the thrown need to either have at birth or assume the first name of a former king (or now Queen)? I know it was important for a few who came to the thrown out of normal succession lines to change their first name to reflect one that honored a former king. If this is right, then the first name needs to be Anne, Victoria or Elizabeth if the baby is a girl. Or I guess they could have a given first name that is different but when/if they assumed the crown, they would choose their name in honor of a former queen. I was told, while on a red bus tour in London ( So I'm talking with real authority here! :-), that Queen Victoria decreed that no one would become King Albert, in deference to Prince Albert, and that's why George VI changed his name when he ascended the throne. I'm confused, though, about why the Queen had to make any ruling about the future princess. Prince Andrew's girls are princesses, did he have to ask the queen to make them princesses or was it automatic since he is the son of the monarch? I thought Anne specifically asked that her children not have titles. It's all confusing, but oh so interesting to me! Yes, I am absolutely as confused as the above poster. Please explain why Beatrice and Eugenie are princesses! Or else, where have princesses come from in the past? Google doesn't seem to hold an answer for me. YEA!!! So happy to log on and see a wonderful update!!! More happy to see that Kate seems like herself again and feeling much better. I am just throwing my guess out there that Baby Cambridge is a July baby. I read today that an announcement of a due month would come after Kate's 12 week scan. Hmmm. I have a June 30 baby and a July 22 baby, so I am remembering back to my pregnancies . Eagerly waiting to hear the Palace announce something!!! Not sure if anyone saw my post yesterday, but had a question about the Queen's decree. If William and Catherine have a girl, she will be titled but won't be allowed to give her children the title of prince or princess according to the article in The Telegraph. I'm confused. She would be the future monarch, but would not have the privilege of giving her children a title? If she can't title them, who can? Thank you for all your wonderful work Charlotte! Can't wait to see what the big news for tomorrow is!!! Hi Charlotte, thank you for the wonderful post it was a nice suprise to see the Duchess on her birthday. I going to guess it is a girl. I was on complete bedrest for 3mo before my daughter was born. Victoria Elizabeth is a name I like. Thanks Charlotte...you do a wonderful job...as always. The video link doesn't work today. Is it?